iheartoliveoil.com has been in business since late 2008. They have two full time employees and a handful of part-time employees depending on the time of year or event. The business started out as an online retail shop. Over time they have expanded into participating at high end food related events around the US such as the Boca Raton Food & Wine Festival. The company has also ventured into importing and wholesaling products. i heart Olive Oil is now the exclusive importer for some award winning olive oils from Europe such as iO & Surat. Mike: Tell me how you selected the name iheartoliveoil.com. Were there other names you were considering? Beth: I wanted the name to encompass the brand, company, and product. iheartoliveoil.com was one of the names I was considering. Since I started the website first it was important that the company had the same name as the website domain name. Some of the names on my list were not available. So making sure the domain was available was most important before we incorporated. 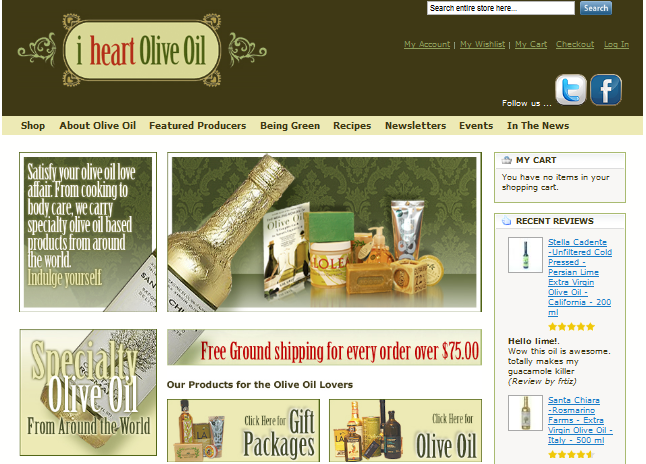 Mike: How did you get involved with olive oil to the point of selling it online? Beth: I have worked in the food & beverage industry for over 15 years. Specifically starting out my career as a chef. I have always had a love for olive oil from working in the industry, but after a trip to Spain one summer I was truly enlightened. I was amazed on how passionate other people were about olive oil. So, with the support of my husband from the technology side I decided to build a store that would encompass the love of olive oil. Beth: Our volume of traffic has certainly been increasing year over year. Specifically in the natural search range, as we continue to build more content and get our name out there. As well the direct traffic is continuing to grow. This is mostly due to repeat business and getting the name out in the marketplace. Mike: Do you have any online marketing strategies that you follow? Beth: We try to focus most of our online marketing on coming up in natural searches or from social marketing. Optimizing our content really helps to bring customers naturally without paying a lot of money for ads and banners. I think it is important to not have a hard sell to the customer, but rather educate them. This creates repeat business. Beth: Yes. Don’t settle! Nowadays everything is virtually online. If you settle for a name and decide to change it later it can hurt your business by loosing customers and your brand image. People are very brand conscious these days and if you switch your name you ruin the risk that they may forget about you. So don’t settle on your name if the one you choose is not available at first. It may push you to be open minded with your name which is fine, but always think long term. Beth: I believe it is also important to remember that online retail is not just about getting people to your website. It is important to keep them there and have them return. Make sure your site is user friendly, has a lot to offer, and you continue the customer service all the way until the package reaches the customer’s door. Shane Cultra is the author behind the popular domain blog, DomainShane.com. He frequently highlights some of the top domains dropping. His area of specialization is plant and garden related domains and 5 letter dot coms. Shane has beem in the domain business since 2002 and owns a brick and mortar business as well. Shane’s blog was one of the first that I came upon when I began getting involved in the industry. It has also been one of my daily reads since then because of his honest writing style and content. Mike: Like many of us, domaining isn’t your full-time job. You have your main business, which you mention in your bio and occasionally in your posts. Tell me a bit about that? Where is it located? Shane: My family started in the nursery business in 1865 (I am the 5th generation) and my father split off and formed his own nursery called Country Arbors Nursery in 1991. I joined him in 1995. We since have added another plant growing operation but our main business is located in Urbana, IL at the home of the University of Illinois. We grow trees, shrubs, perennials, and annuals and sell both wholesale and retail. At peak we have 40 employees and of course, spring is our busiest time. Mike: Tell me how you came into the domain industry back in 2002. At what point did you become serious about domains? Shane: I have always bought and sold something. From Star Wars toys in the 70’s, baseball cards in the 80’s, and then ebay in the 90s. I was one of the beta testers of Ebay as I ran auctions on the bulletin boards and they contacted me and wanted to see if I wanted to do my auctions on ebay. That was in 1997. I actually started buying domains in 1995. I just wasn’t smart enough to buy good ones. I bought my daughter’s name and funny names. I don’t think I actually had a strategy until 2005. Now that I think of it, I may still not have a strategy. 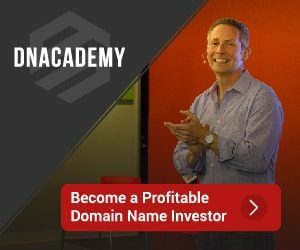 Mike: Would you say your domaining strategy is primarily flipping domains or developing? Which have you found to be more profitable? Shane: My most profitable area would be selling my built websites. In total I have been part of selling over 6 million dollars in websites. Some I owned a small part, others were all mine. Presently I make 90% of my money flipping names. Mike: Who have been some of your influences in the industry and why? Shane: I actually don’t have many influences but will say that people like Patrick Ruddell, Morgan Linton, Ron Jackson, Yourself, and Elliot Silver have really been kind to me. Helping me out, answering questions, doing me favors. My favorite domainer is/was probably Reese Berg. He used to have a blog called 4 letter noob and I just loved his passion, foresight, and data collection. Of course, there are plenty of domain investors I respect and aspire to follow and a few that I don’t. Mike: You seem to have a knack for gaining the attention of the mainstream media. What are some outlets that have mentioned you as a source and how were you able to gain that attention? Shane: What I learned early is that writers and tv reporters do this for a living. They are people just like you and I and their job is to find stories to run. They actually thank you for helping find a good story. Just like a blog writer they have trouble finding good info to write about. Locally I send all the reporters leads and in turn if I need some publicity they will do a story that will help me out. I help them do their job and they help my business. It’s a fair trade. Over the years I’ve become very comfortable behind the camera and have been appearing on TV every week for the last 15 years. I work with ABC, CBS, and PBS but I am ABC’s local “Garden Guy” each Tuesday at noon. I have a couple writers I work with at the NY Times, Chicago Tribune, and a few other papers but not as actively as when I had my bigger web site. I just called them or emailed them with the story. I will also say you have to make it a good story idea. If you are just looking for publicity you need to send out a press release. Mike: In a recent post, you mentioned “If you want to make good money in this business you don’t want to sell to domainers.” What are some of your most effective strategies for reaching end users? Shane: I am one of the worst domain investors when it comes to end user contact. My business method is simple. Make sure that someone who wants to buy that domain can easily buy it. I put all of them on Sedo because it is very easy for potential buyer to make a bid. It also gives me the opportunity to take it to auction. I have started listing some on Afternic and have been adding names to Godaddy’s list as well so that someone who types in a similar name can see that mine is for sale. This method seems to work for me. I sell enough names to cash flow my whole business and buy new ones. I haven’t added any “paycheck” money aka money from regular paycheck, into my domain investment account in 5 years. They seem to always come at the right time. I was a little short of cash for a purchase this weekend and magically someone comes in and buys a 5 letter domain for a $1000. Rather than spend time contacting the buyers I concentrate on getting solid names. Good names find their own buyers. Mike: What is your opinion of TLDs outside the traditional .com, .net and .org? Shane: I am almost 100% dot com. I will buy a super high search and CPC dot net or dot org but they are development only names. I have never bought anything but a dot come to flip. I’m sure there’s money in the other tlds as I’m sure there is money in selling trailers to trailer parks, it’s just not for me. I like the beach. Mike: What’s the best piece of advice you have for any new domainer? Shane: I have a couple things I preach, Inch by inch, life’s a cinch. Making money is easy if you keep a routine. If you do a little each day that takes you towards your goal you’ll get there. Don’t worry about the awesome domains of other people or what success they’ve accomplished. Do a little each day,have fun doing it and eventually you’ll start to see some payback. Getting rich quickly doesn’t happen that often. If you dart around, chasing trends, keywords, or CPCs you’ll end up with a portfolio that may look good to the automatic domain price evaluators but will look like garbage to an actual human that is buying solid domains. Back in August, I mentioned how I caught an episode of Morgan Linton’s live web show. It’s great to see things done differently, and to get the know the personality of one of our industry’s enthusiastic bloggers. I’ve caught the show several times since then along with the catch phrase “No No No!! Don’t Develop That Domain,” and wanted to take a deeper dive into the domainer in front of the camera. Mike: It always interesting to hear how people landed where they are today. When and how did you develop a passion for domain names? How long have you been doing this? Morgan: I started getting interested in domain names only three years ago in the summer of 2007. I had some extra money that I was looking to put in an investment vehicle that wasn’t the stock market. In fact Linton Investments was originally formed as a Real Estate investment company. I was planning on buying land in Maine and developing in an area that at the time was very inexpensive. However this was also when the market was just starting to dip and I’ve always told myself never to invest in a declining market. So I had to look for some other investment vehicle and I stumbled on Domaining after finding Sahar’s blog Conceptualist.com. It only took a few minutes for me to immediately realize what a perfect fit this was for me. My background is in Engineering and I also ran a web development company in the mid-90’s so the idea of virtual real estate was very appealing to me. The only thing that didn’t make sense to me was Parking, I didn’t understand why people wouldn’t want to rank well in the search engines, so I took a different approach. The early success I had with monetization showed me the true passive income potential of domains, once the money started coming in it was hard to not be completely hooked! Mike: I’ve heard you say several times that you make most of your money through developed domains as opposed to selling domains. Do you feel development is the best choice for domain investors? What makes development a better overall strategy than flipping names for profit? Morgan: I think that development is one of the ways that investors can make money with domains. While I personally like monetization more and use it as my own strategy I know plenty of people that make good money buying and selling domains. So I wouldn’t say that it is the best choice for domain investors, it really depends on what the investor is looking for. I’m a passive income guy, it’s in my family and something that’s been ingrained in my since I was a kid. In any business I like the model of building a system that will make money whether you are actively doing work or not. Monetizing domains means doing some work upfront to achieve consistent revenue every month. One of my most profitable months was when my girlfriend and I went on vacation for a month, I did no work and had one of my best months of revenue ever. There is a lot of money in buying and selling domains and this is a good choice for some Domainers. First it’s a much quicker process to get money and usually comes all in one burst. The reason I’m not crazy about buying and selling domains is that to sell a name you really have to actively work. If you take a month off you won’t sell any names and your business will crumble. It’s not passive and so it’s not for me. It doesn’t mean I’m not a hard worker or I don’t like to sell, I love sales and have been doing it for years…it just comes down to what kind of income stream you want and I’m a passive income guy. Mike: I’ve recently become a regular viewer of MorganLintonn.tv after my first visit, which I previously posted about. There is a huge difference between watching a video and being able to interact with the host and other viewers. What are some of the benefits you have seen and experienced from running this live program? Morgan: I have been blown-away with the initial results of MorganLinton.tv – it definitely is the most effective way I’ve found online to really interact with and engage an audience. It’s a lot more work than I thought it would be since I’m not only hosting the show but also producing, setting-up the lights, mixer, etc. In the end I think it’s allowed me to reach Domainers all over the world and the ability to chat and share comments and ideas in real time offers a unique experience that you can’t really find on a forum or blog. I have big plans for MorganLinton.tv and this is only the beginning, from what I’ve seen it’s independent television programs and channels like this that represent the future of broadcasting. Mike: Your company, Linton Investments LLC, owns a diverse collection of domains ending in a variety of TLDs, including com, us, net, tv, org, me and others. What is your philosophy on the different TLDs for development and investment? Are ccTLDs a risky investment? Morgan: We do have a very diverse portfolio spanning over 25 different TLDs. I look at each TLD as an investment with a different time horizon. My .com, .net, .org, and .us names are oftentimes where my development and monetization time is focused. If I sell a domain it will most likely be in one of these four TLDs as well. Many of the other TLDs I invest in are for a longer term and like a stock, I have significant reason to believe the value will increase over the next 2-5 years depending on the TLD. I think you have to think both short-term and long-term in this industry. If you don’t think long-term then if a TLD turns-out to be a great success you’re buying at full retail when you could have bought at wholesale a few years earlier. I think markets like India have a ton of potential and investments in this space could be a good play in the long-run. At the end of the day I always remember that I’m running a business. I put a majority of my focus into the things my business does to make money which is developing and monetizing domains. I pick targeted long-term investments with no expectation of immediate revenue but the belief that the value will rise dramatically in the future. As a Domainer you have to always stay focused on revenue, if you’re not making money you really aren’t investing. At the same time you have to look at where your business will be 2, 3, and 4 years from now and plan ahead. I don’t see ccTLDs as a risky investment as long as you do your homework and buy ccTLDs that make sense. Don’t buy a US city name in .MX, don’t buy an English colloquialism in a .DE. Buy domains that make sense and really focus on premium names in the ccTLD space. I usually look for one-word premiums that had their corresponding .com sell in the six-figures. These are the names that I think have the most potential of being valuable in the future. Mike: I’ve also heard you mention lead generation as a monetization strategy for developed domains. How does lead generation work and how can it produce revenue for a site owner? Morgan: Lead generation is a new strategy I’ve been working on this year. The idea is that you can put a simple form on your website and when a visitor fills-out the form you get paid. The thing I really like about lead generation is that in some niches the payout per lead can be quite high. Just think, if each patient a Doctor gets makes them an average of $50,000 over a few years how much is that client worth to them? The challenge with lead generation is that there are a lot of players in the hot spaces so if you want to play you have to bring your A-Game. I’ve found that the guys with a lot of success in most of the hottest lead generation niches use some major SEO to rank well and beat their competitors. While there is money to be made a quick mini-site won’t cut it in most lead generation spaces. Right now I’m working on getting a DWI site that I have performing well before replicating the model out to other sites. I always recommend that people spend time getting a model right before perfecting it. I did this with my Adsense sites, then my affiliate sites, and now I’m doing the same in the lead generation and direct advertising space. If you’re not taking the time to find-out what works you could be replicating a failing model! Mike: What is your primary strategy for acquiring domains? Do you hand register, drop catch, buy from auctions and other domainers? Morgan: Most of the domains I buy now are through drops. I spent some time every evening on Snapnames and now focus mostly on buying .com names. When I hand-register I usually focus on .us and picking-up long-tails in niches I want to dominate in the search engines. I have bought a few names from live auctions this year as well like at TRAFFIC Vancouver and think there are some good opportunities there as well. What I like about buying expired names is you can get the exact-match domain with a bit of age which really helps a site rank well quickly. Also if I can snag a great .com I have the option to develop or sell it whereas you have much less resale potential with a .us or .org name. Mike: What is your advice to someone starting out in domaining today, or maybe someone who has been in it a while and is just slow moving? What is the most effective means to develop a small portfolio of profitable domains for investment or development? Morgan: I recommend that everyone starting in this industry NOT buy domains initially. Spend the first few months reading Domaining.com and learning what people do and how they make money. I think it is so easy for people to get excited about Domaining and just jump in without learning the basics. Registration fees can add up and if you’re not making money with your domains you really are collecting rather than investing. I get emails every week from new Domainers with large portfolios of garbage, all things that sounded great to them at the time but really have little potential for development or resale. To get started learn the basics and reach-out to someone who is making money in the area you want to make money. The great thing about this industry is that many people are more than happy to share their strategies. Learn what other people have done to be successful and replicate that. Don’t start-out with hundreds of domains, buy five or ten max and make money with every single one of them. If you can do that then you can buy more because you have a successful model. This is the biggest mistake new Domainers make, they don’t look at how they will make money with a domain before they buy it. Find a model you like, prove it out, then repeat, if you start with the repeat part before proving your model you might end-up with a collection of domains that gathers dust over the years. Mike: What skills do you feel are essential for domainers to possess in order to be successful? Morgan: To be honest with you I think the only skill someone needs is persistence, everything else can be learned and is readily available online. People looking for a get rich quick scheme should stay far away from Domaining, everyone making money in this industry does so because they’re working hard! You can’t be afraid to fail, instead you have to keep working at it and find what works for you. Some people might be great at buying and selling domains but terrible at development, you may like building geo-domains but nothing else. We’re all different and it’s finding the model that works for you in this industry that is the key. Once you find the model persistence will bring you success, I know hundreds of successful people in this industry, all with different skills-sets but every one of them is persistent, never give-up, this is the future! I read an article at CNN.com the other day entitled What your e-mail address says about you, likely inspired by the Facebook messaging announcement. It basically spins through the spectrum of mail services such as aol, hotmail, gmail, etc. and how telling those domains are about the type of person you are. Aol being the least favorable and gmail ranking toward the top. But the article is clear to point out users that use their own domain, user@yourdomain.com, are considered at the top of their mail-o-meter graphic. That is, users that use their own domains are considered skilled and capable. Now there is nothing official about this article, just some common sense reporting with a little humor. But the fact holds true that having an email address at your own domain lends credibility. Who would you rather let in your home, joescarpetcleners@aol.com or Joe.Smith@TownCarpets.com? Sure, an email is just an email, but it may be the first impression some people have of you. As a web designer, I have clients that, although they have their own domain, still insist on using their old aol, or similar email address. I have also fallen into this. While I have my own domain email for web design purposes, I use my gmail address for most of my domaining needs. I can’t honestly say why I chose to do that over creating a new address at SullysBlog.com. I recognize that it’s difficult to make the switch, but it’s probably something I should do. If part of your domaining strategy is to send emails to end users, this could be an important lesson. If you are positioning yourself as a professional and your email address doesn’t reflect that, you may be putting potential sales at risk. On October 28th, I’ll be attending the Tech Cocktail Startup Mixology Conference in Chicago. Initially, I was planning to attend only the after party portion to socialize with some new business startup owners. The more I thought about it, the more I could see the tremendous benefits in attending the event. The conference promises to break down every ingredient that goes into starting and running a successful business. The speakers in the event have a variety of different perspectives but all have one common thread, they are successful entrepreneurs. The speakers include Brad Feld, Managing Director of Foundry Group, who has been an entrepreneur for over 20 years. Also on the list is Eric Lunt, CTO of BrightTag and co-founder of Feedburner. Another includes Genevieve Thiers, the founder of Sittercity, Inc. which was America’s first company to take babysitting services online. The list goes on. I’ve said it before and I’ll say it again, if you buy and sell domains, even part-time, you are running a business. If you’re developing sites to generate a revenue stream, you are again, running a business. Talking to, and more importantly, listening to people who are highly successful in starting and running business is a sure fire way to meet your goals and get better at what you do. I’ll be sure to bring back a full report of my experiences and any interesting individuals I have the opportunity to meet. If you’re in the Chicago area and would like to attend, Tech Cocktail is offering a 15% discount to Sully’s Blog readers who enter the discount code sully. If you don’t make it to the conference, consider attending the after party and let me know if you’ll be there, I’d love to meet you in person. Yesterday evening, Elliot Silver of ElliotsBlog.com posted a unique proposition. He has offered to select one reader and teach him or her how to sell a newly registered domain name to an end user. This is quite an offer. Elliot is not only well respected in the industry, he’s damn good at what he does. The thing I like most about him is that he shares more about his business and strategies than anyone else I have found. This particular offer he is making was prompted in part by an email he received some time ago. An email from someone new to domaining that wanted to learn from some one who was doing it right. Someone looking for a mentor. That e-mail was from me. I originally stumbled across Elliot’s blog while considering selling a domain I have owned for over 10 years. I had been debating weather to relaunch it or just sell it. I was looking for venues where domains were selling. I was pulled into the blog and found myself visiting it regularly. Years ago, I had an interest in domaining, but never persued it and here’s a guy that shares some great information. I was inspired. I started buying domains, mostly hand regs. I wanted to learn the industry. I emailed Elliot and asked if he would mentor me and I would share any profits with him. As he mentions in his post, “I passed because that seemed like a lot of pressure and I didn’t feel qualified to be a mentor.” So instead, I studied the industry. I followed ElliotsBlog.com religiously and others as well. I joined forums and talked to people, did Google searches and read books. I took some of Elliot’s sample end user emails and put them to work. That’s how I made my first couple of sales. I haven’t stopped my study of the industry by any means. In fact, this blog is a part of that. I am sharing the information I have learned and continue to learn along the way. What excites me about this industry is that it not understood by the masses, evolves quickly, and offers great opportunity to those willing to invest the time to learn and take chances. Clearly we are flooded with crappy domain names for sale, and it tends to dilute the perception of value. But then again, the great names tend to rise to the top. I want to mention that I don’t know Elliot. I have never talked to him out side of some brief email exchanges and forum postings. But I obviously have a lot of respect for him. Good luck to all those that enter Elliot’s contest to be selected. But keep in mind, even if you don’t get selected, his blog offers you most of what you need to get started. Spend some time reading and asking questions, trying and failing, trying and succeeding. Do whatever it takes if you are passionate about domaining. If you are in it to make quick and easy money, walk away now, because that’s not how it works.